There's no real connection between Fortnite Twitch star Ninja, singer-songwriter Logic, cartoon comedy duo Rick and Morty (both voiced by Justin Roiland), and Fallout 76. I mean, Logic's music doesn't sound a thing like 'Take Me Home, Country Roads,' and to my knowledge Rick and Morty have never traveled to the Appalachian mountains. But that didn't stop Bethesda from enlisting all of them for one hell of a collab stream. The pop culture pillars are teaming up to play the Fallout 76 beta this Thursday, and if nothing else, it's sure to be something to see. The stream starts at 6pm PDT / 9pm EDT / 2am BST on November 8. You can watch it via Bethesda's Twitch channel, Bethesda's Mixer channel, the Xbox Mixer channel, or the livestream tab of the Adult Swim website. I reckon most viewers will pile into Bethesda's Twitch channel, so you'll probably find the most active chat there. And honestly, I'm mainly here for the top-shelf Twitch chat this stream will lead to. Sadly, the stream doesn't start until after the final public Fallout 76 beta, meaning there won't be a cavalcade of stream snipers struggling to queue into the trio's server. Which is a darn shame, honestly. Sure, it would've been horribly disruptive, but unscripted PvP is the spice of life. Here's hoping Ninja and the gang at least find Mothman out in the wilderness. 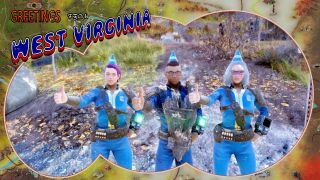 Looking to play the Fallout 76 beta yourself? We've got everything you need to know, from session times to system requirements.